CAPE CANAVERAL, Fla. - NASA will try a second time to launchits experimental Ares I-X test rocket Wednesday, after cloudy weather and minorsetbacks foiled a first attempt. The $445 million rocket is the firstof its kind - a prototype of the vehicle NASA plans to carry people toorbit and the moon - though it is based on space shuttle and other earlierhardware. The test launch, slated to lift off at 8 a.m. EDT (1200 GMT), is intendedto study how well this rocket design works by gathering data from over 700onboard sensors. Repeated attempts to launch the rocket Tuesday werethwarted by clouds, strong winds, and the risk of a phenomenon called"triboelectrification," which can be created when a rocket passesthrough clouds and triggers static electricity that could interfere with thevehicle's instruments. Additionally, an errant cargo ship that had strayed intothe danger zone over which the rocket was planned to fly stalled one launchattempt Tuesday morning. Other events, like a stuck sock-like instrument cover,which crews had trouble pulling off the rocket, further plagued liftoff plans. 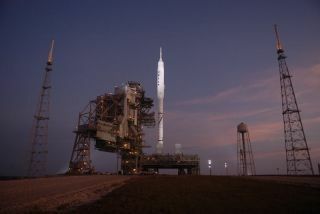 While NASA had a four-hour window starting at 8 a.m. EDT(1200 GMT) to try to loft the rocket, conditions never lined up and missionmanagers gave up for the day at around 11:30 a.m. EDT (1530 GMT). "We had some opportunities, we just didn't get there -the weather didn't cooperate," launch director Ed Mango said after callingoff Tuesday's attempt. Weather conditions Wednesday are expected to be slightlybetter than Tuesday's were, with a 60 percent chance of clear skies. NASA hasstringent weather requirements for this flight since it is an untested rocketconfiguration, and cameras need aclear view of the launch to take useful data for analysis. The 327-foot (100-meter) tall rocket is slated for atwo-minute fact-findingflight that will reach a maximum altitude of about 150,000feet, or 28 miles (46 km), after which it will land in the AtlanticOcean and boats will collect its spent first stage for study. SPACE.com will provide full coverage of NASA's Ares I-Xtest flight with Staff Writer Clara Moskowitz in Cape Canaveral, Fla., andManaging Editor Tariq Malik in New York. Clickhere for live launch coverage and mission coverage. Live coverage begins at5:00 a.m. EDT (0900 GMT).